The 10-2 Rule is the guideline for determining the amount of chimney required for proper operation and draw of your wood burning fireplace or stove. This guideline is the same for exposed “naked” chimney’s as it is for enclosed chimney’s in a chase. 1. Is your chimney within 10′ of your peak? 2. Is your chimney farther horizontal than 10′ away from the peak? 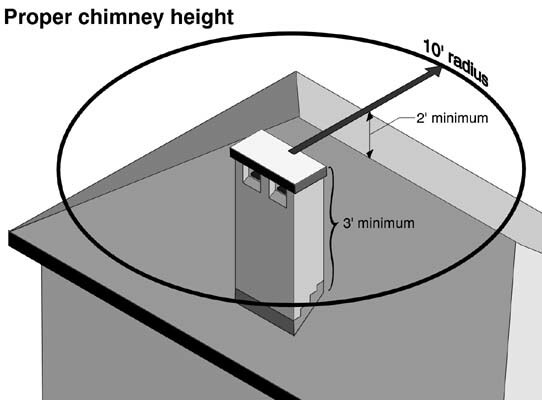 If you are farther than 10′ away from the peak, your chimney needs to be 2′ above the highest point within 10′. For example, your chimney is exiting 20′ away from the peak and you have a 6/12 pitch roof. If you draw a horizontal line 10′ the chimney will be 6′ from the shingles and you need to add 2′ from that mark, therefore you will have a total of 8′ of chimney above your shingles. Please note: if your chimney is exposed and is greater than 5′ tall, a Roof Brace Kit is required to keep it supported. 3. 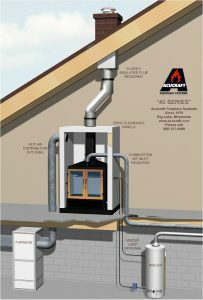 Does your chimney have more than 2 pair of elbows and/or is your chimney being installed higher than 4,500′ above see level? All rules and guidelines have exceptions, the more offsets you have and the higher the elevation the taller your chimney will need to be. For example, if you are building in Breckenridge, CO which is appx 9,600′ ft above sea level OR you have two pair of offsets, we would need to analyze the fireplace opening, the total chimney run in feet, the distances between the elbows and how much is offset. It is amazing that if your chimney is 6″-12″ short how the draw is impacted. As always, if you have any questions please let us know. Linear Gas Fireplaces have a wide 4′ to 16′ viewing area and normally are not very tall 18″ to 36″. Although, some of our clients want a taller viewing area of up to 48″. 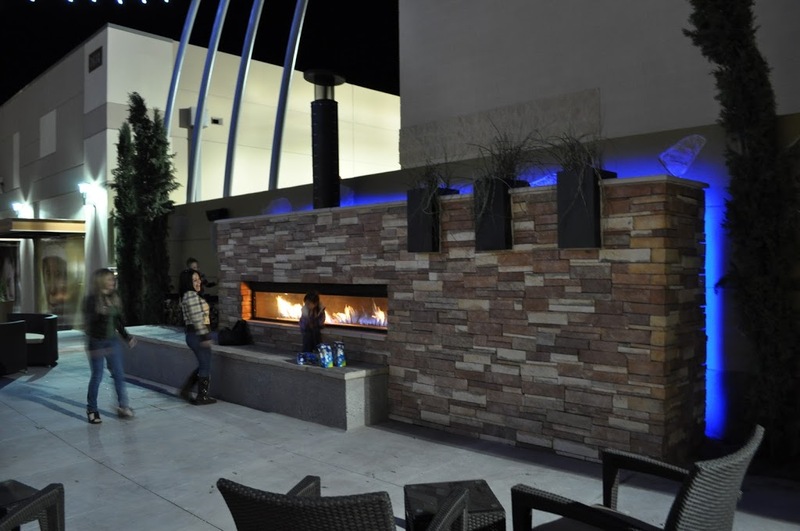 There are five key decisions in designing your custom linear gas fireplace. 1. 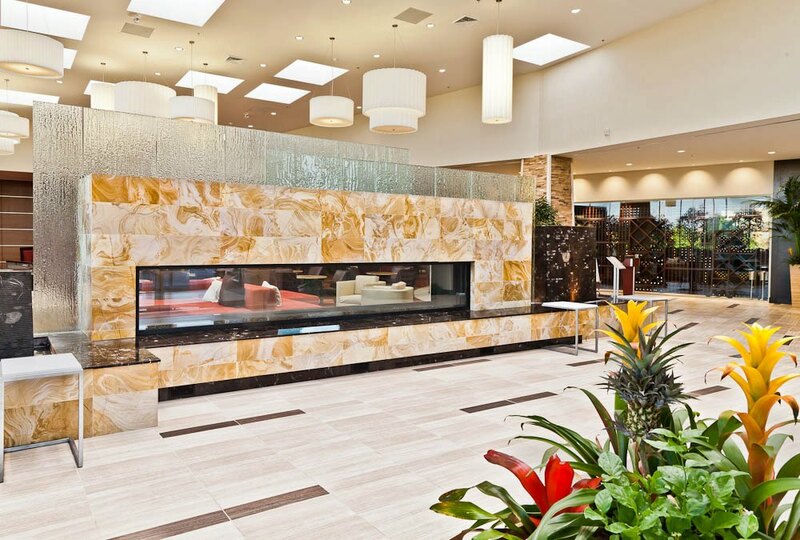 Linear Gas Fireplaces can be single, see through or multi sided, what fits your commercial building or home the best? 2. How big do you want your viewing area to be? Width and Height and Depth. Remember, this can easily change as we go through the design process with you. The majority of the designers and architects we work with design the linear to be 3-4x wider than tall, therefore an 8′ wide linear is 2′ tall. The rules are not steadfast, many of our 12′-16′ wide fireplaces are 2′-3′ tall. Option 1: is a single line burner and the media does spread it out a little. Option 2: is a pan style burner that more evenly distributes the flames. 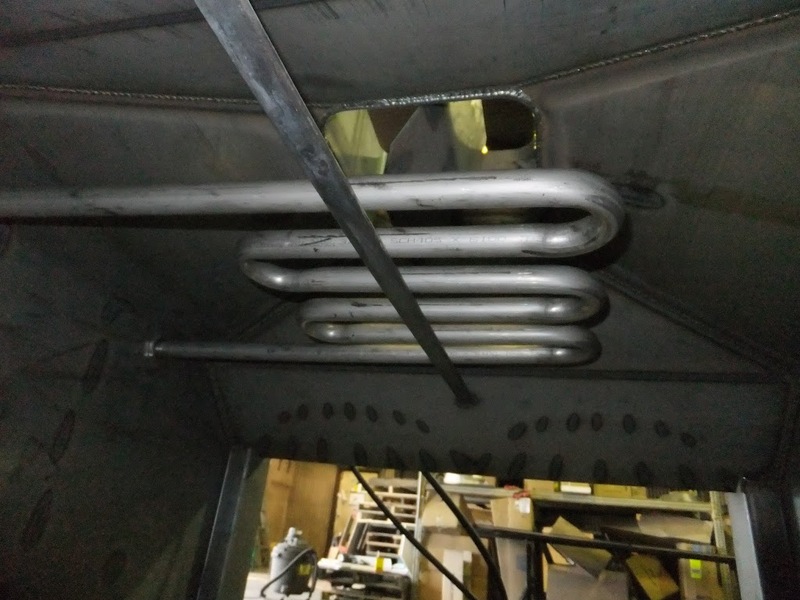 Heat – If you are not looking to achieve any heat from the fireplace we design a heat relief duct to transfer it outside, you can then have the large flame without having to worry about the heat. Glass Crystals are round and smooth. They are designed to be used with fire, the mirrored reflection from the fire and the radiant heat is great! This linear fireplace is open – no glass or front. The view is front and right side. 1. How are you going to vent your fireplace? – vertically through your roof, horizontally out the side wall or down in through the floor. All our linear fireplaces use class A insulated stainless steel flue. 3. The fireplace will require a gas line and some require electrical for the ignition of the pilot. 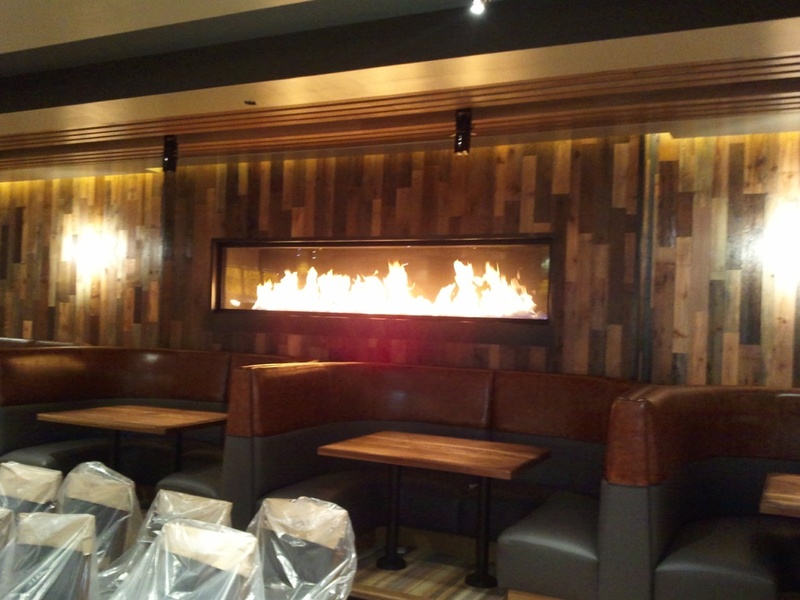 As always, the Acucraft Custom Fireplace Design Team is there to guide you through the process. Please comment on this post to let us know if we answered all your questions. What is the difference between a fireplace and an insert? There is a lot of confusion about the difference between a fireplace and an insert. The actual definitions vary by region, I will explain the main differences between the two categories. 1. 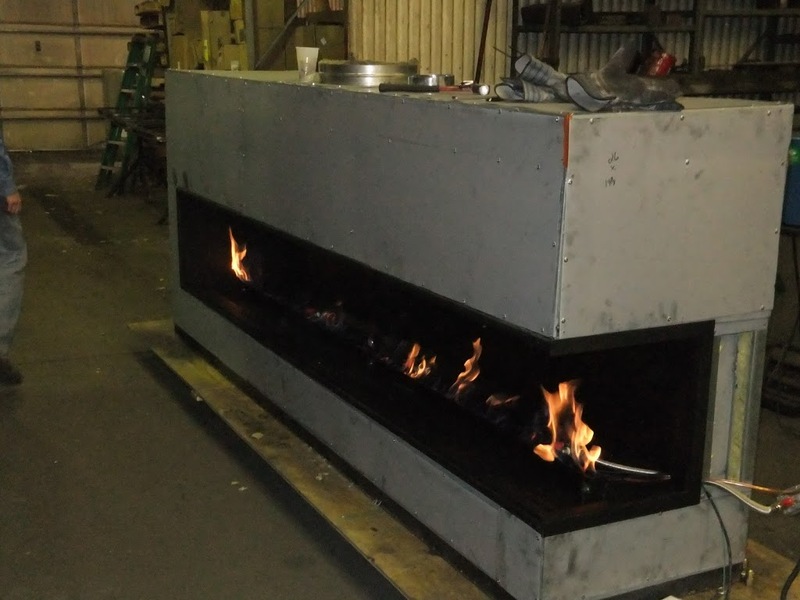 Factory built fireplace – Acucraft manufactures factory built fireplaces that are pre – engineered systems where the chimney system and combustion air inlets along with controls for both are incorporated. The factory built fireplace is set in the home and built around with framing and stone. The fireplace on the right is a factory built fireplace by Acucraft and the fireplace on the left is the same fireplace with our insulated panel system. The fireplace installed above is the completed factory built fireplace. This fireplace has the rustic arched doors with grids. 2. Open hearth fireplace – Open hearth fireplaces are typically built on site by a mason. The firebox is lined with real firebrick. 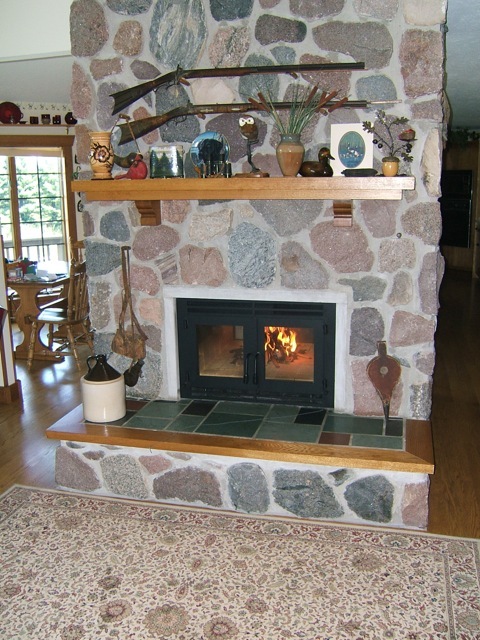 Open Hearth Fireplaces provide alot of ambiance, however, the efficiency is appx -35%. The average open hearth uses very little outside air combustion and appx 300 cubic feet of air per minute is pulled from your home and goes up the chimney flue. Please note: all Acucraft wood burning fireplaces can be operated as an open hearth by simply removing the doors or burning with the doors open, providing your home has adequate make up air. Open Hearth Fireplace – They will provide some heat for the area around the fireplace, however they are very inefficient and alot of the heated air in your home will go up the flue. Turn up the furnace prior to starting a fire. 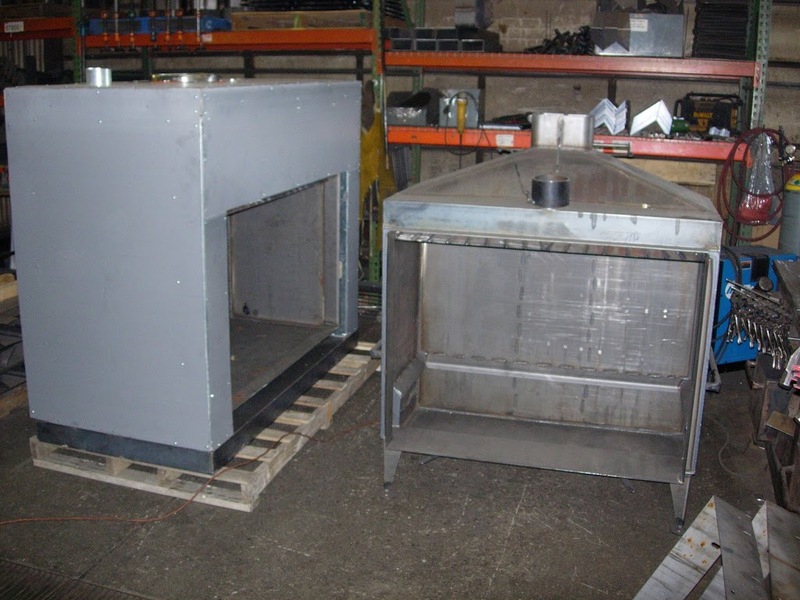 Inserts are units that are designed to fit inside an existing fireplace. 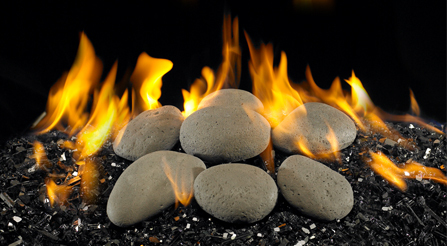 They are most popular inside the open hearth fireplace because they can help the system burn more efficiently. Custom inserts are very expensive and difficult to design. Many Inserts require a lot of steel around the insert, called flashing, to close off the area between the little insert and the fireplace opening. 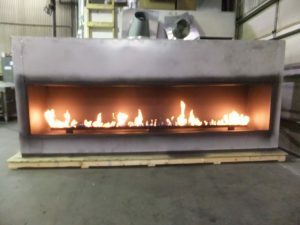 Acucraft does not manufacture Fireplace Inserts. Because we design our fireplaces to create more heat than any of our competitors, a traditional flue system will not handle the heat output our fireplaces create. 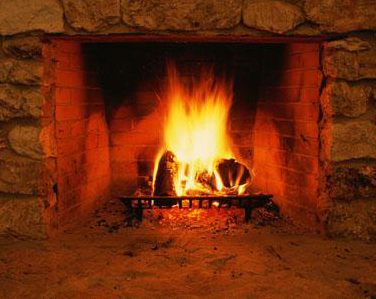 We require a Class A Flue system with our fireplaces to ensure safety. We hope this post helped explain the difference between a fireplace and an insert. As always, if you have any questions please call us to further identify the perfect solution for your needs. 763.263.3156 and ask to speak with a selection specialist. Acucraft’s whole home heating technology is a great way to maximize your fireplace and its heating potential! With the use of Remote Ducting and the Water Loop, you can heat both your air and your water with just your fireplace! The two options cost very little to install and they offer a huge return. Many wood burning customers who install both options use very little gas or electric to heat their air or water all winter long. Acucraft’s Remote Ducting option aids in the goal of heating your entire home as evenly as possible, with the elimination of cold spots. The Remote Ducting option uses B-Vent pipe to vent heated air to other areas of your home. You can vent to anotherroom on the same floor, upstairs or even below with the use of an in-line blower (this is different from the fireplace blower). You can even connect your Remote Ducting system into your cold air return and use your furnace fan to evenly distribute the heated air throughout your home, eliminating cold spots. The diagram above shows the remote ducting taking the heat from the fireplace and transfering it to the furnace for distributing heat throughout the home using the existing ducts. Many of our customers have the duct end at the basement ceiling. With an in-line blower in the basement ceiling when you want the heat in the basement just turn on the in line blower. 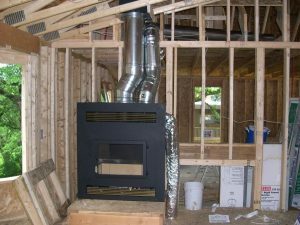 The Z-MAX Fireplace photo above shows the remote ducting, the 8″ duct on the right of the fireplace flue, transferring the heat from the fireplace to the other end of the home. The customer also installed an in line blower with variable speed to control the amount of heat transfered to the other end of the home. The duct can transfer up to 70% of the heat generated by the fireplace. The Z-MAX is capable of 130,000 BTU’s an hour, so we are talking about a lot of heat – the average furnace is under a 100,000 BTU’s an hour. 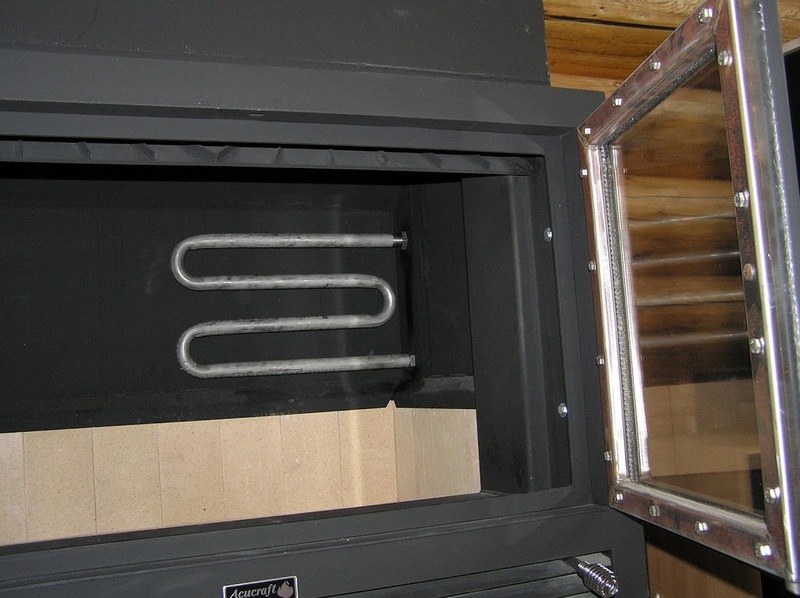 The Acucraft Water Loop is a stainless steel loop/ coil that is factory installed into the fireplace that can be used to heat your domestic water and/or your radiant in floor heating systems. The loop is designed to be a supplemental system. 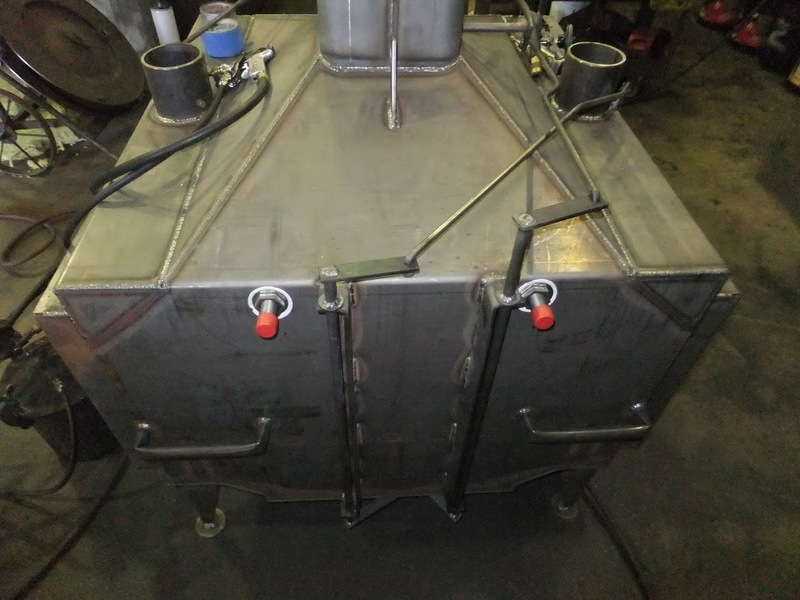 A small thermostatically controlled pump is installed that will automatically start circulating the water when your firebox becomes heated, providing supplemental heat for your water. The above photo shows the Water Loop in one of our see through fireplaces, the loop is located in the center of the firebox. The photo shows the exterior of the fireplace, the water lines connect to the water loop where there are currently the red proctective caps. One line bringing the water in, the other bringing the hot water out. The remote ducting and the water loop are part of the Acucraft’s whole home heating technology. 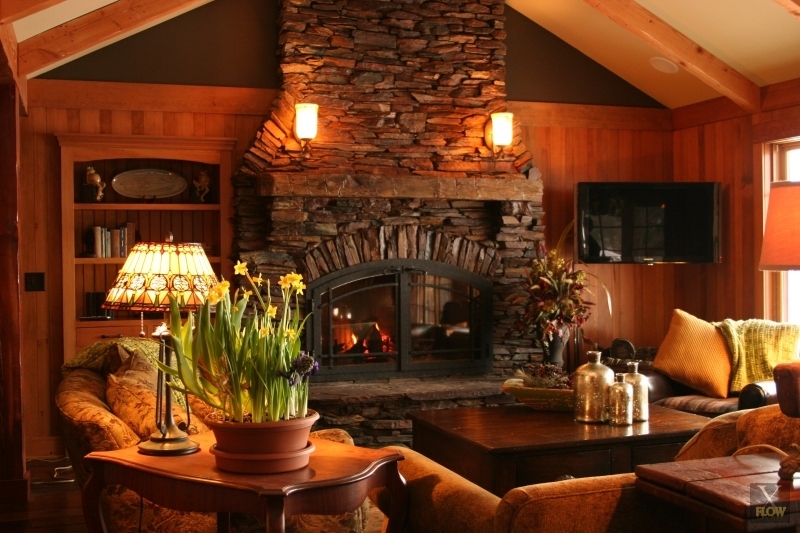 The options are all hidden within your fireplace and with the thermostat control, they turn themselves on and off. If you have any questions, please contact Acucraft and we can assist with your specific whole home heating plan. Acucraft just finished test firing a large custom linear gas fireplace. 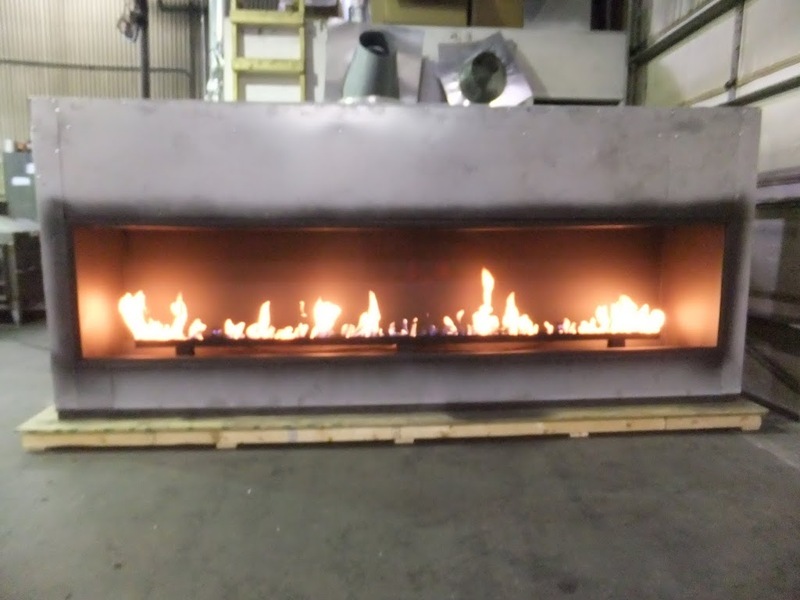 Prior to shipping all custom gas fireplaces, we burn and test every fireplace. 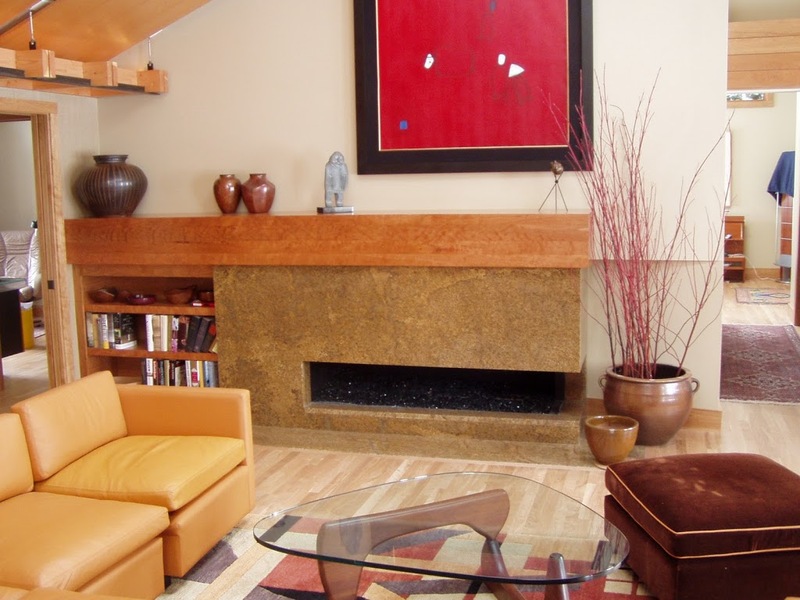 The below fireplace has a huge 120″ wide x 24″ high viewing area. The customer wanted a large 12″ -18″ flame and has propane as the fuel source. The pictures do not do justice to how awesome the flames look. Propane Gas and huge flames from a propane fireplace are difficult to achieve. Propane is heavier than air, Natural Gas is lighter than air. Propane needs to be delivered at 3X the pressure of Natural Gas, which requires much more outside air for combustion to be mixed with the Propane Gas. The addition of more outside air turns the flame blue. Acucraft and our customers desire tall slow moving yellow flames. 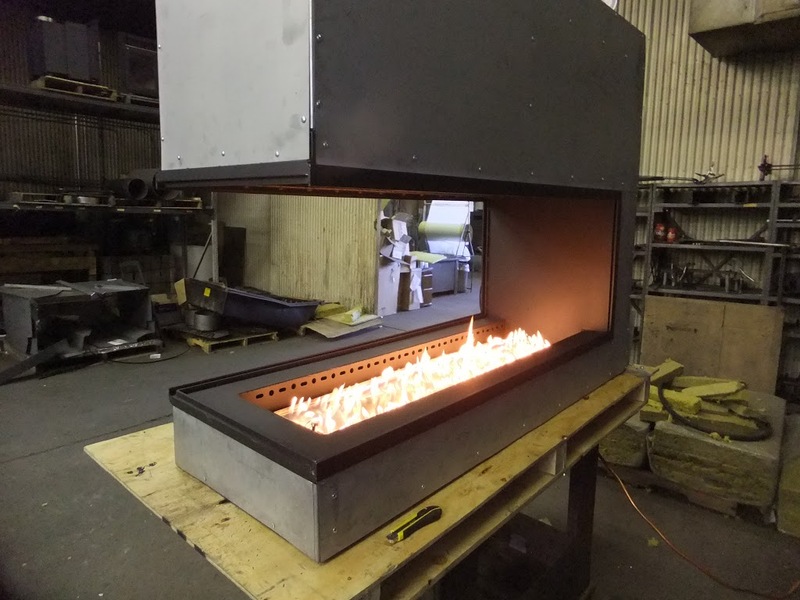 Therefor we at Acucraft, Custom designed a long 100+” elevated burner with the gas entering the burner in 3 areas, middle and both ends. This will evenly distribute the Propane. The design included 3 large 200,000 BTU valves, with variable flame height control via remote control. Below is a link to a video of the fireplace in action. 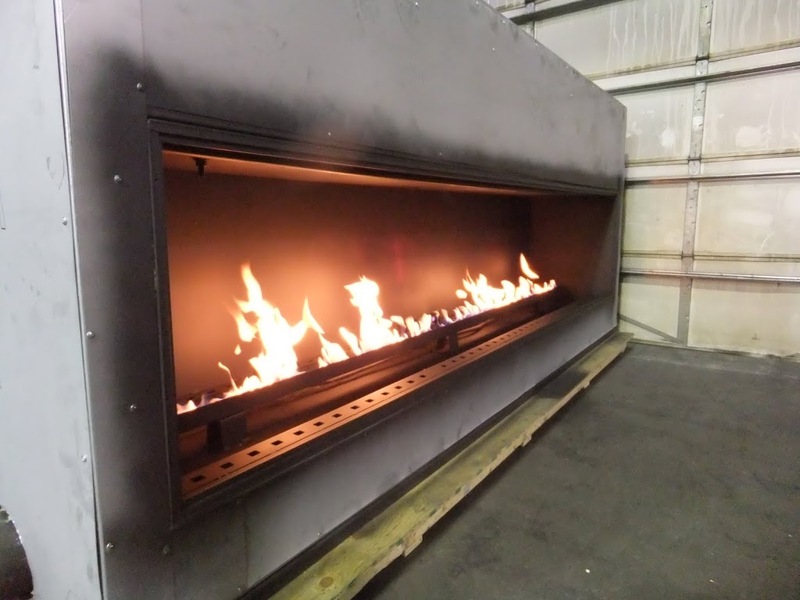 The Customer selected recycled glass as the media, which will be installed at the site to hide the burner and more evenly distribute the flame. 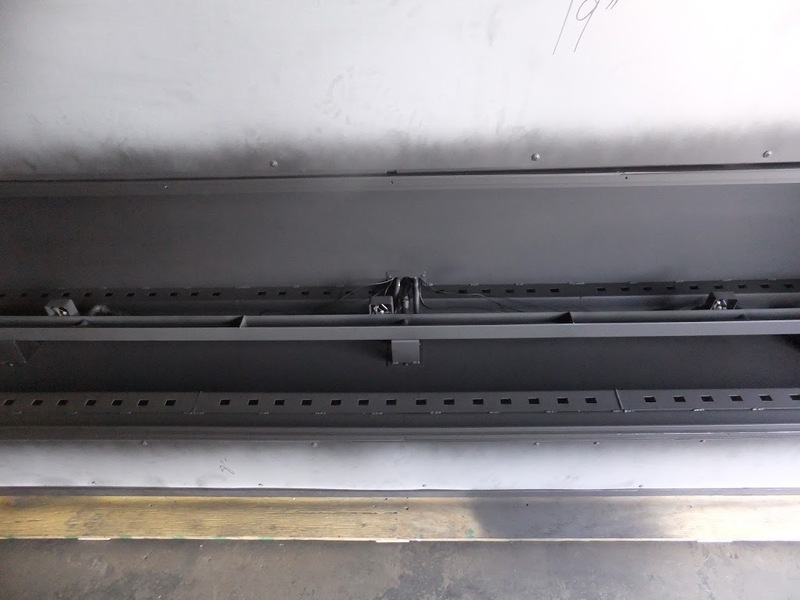 The outside combustion air will be distributed to the firebox in the slotted openings, shown above along the front flange. There is two panes of glass, this will keep the glass cooler to the touch with air transfering between the glass. This Fireplace along with another large custom fireplace are being shipped to there new home in Indiana. The fireplaces just keep getting bigger, below is a photo of a huge gas fireplace we are testing tomorrow. 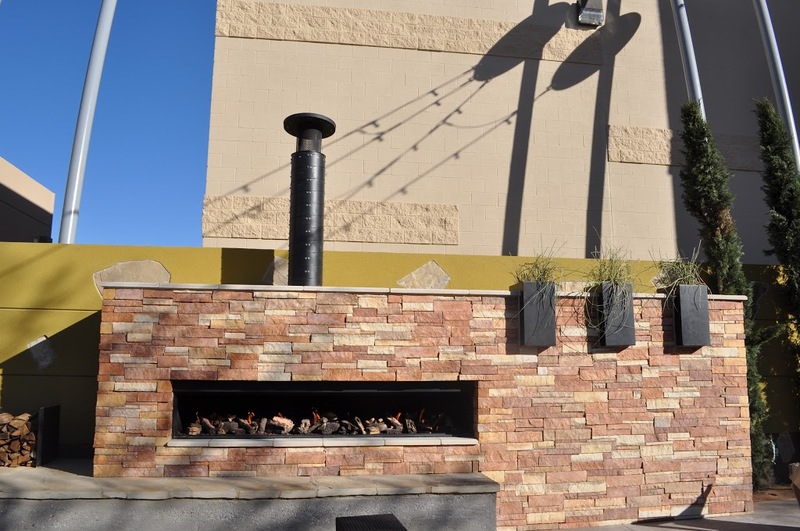 The dimensions on this fireplace are 11′ wide and 3′ tall = 4,752 square inches of viewing area. 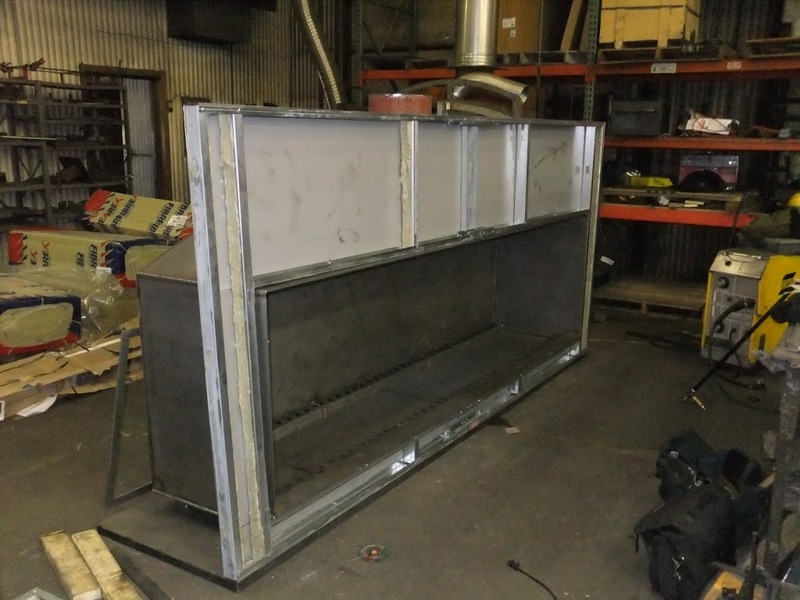 The firebox is completed and the insulated panels are being installed. Tomorrow we burn and test.